by Marwa Fatafta, for Al Shabaka Palestinian Policy Network. Palestinians recently ranked corruption as the second largest problem they face after the economic crisis – higher than the Israeli occupation, which ranked third. Indeed, Palestinians generally view Palestinian Authority (PA)officials as a self-serving, elitist group disconnected from the Palestinian national struggle and the daily sufferings of the people. Such perceptions are fostered by the failure of the Oslo Accords, the death of the Palestinian statehood project, and the continued fragmentation of political leadership in the context of Israel’s ongoing oppressive occupation and its violations of Palestinians’ fundamental rights. The present reality of the PA in no way resembles the kind of Palestinian government promised since the heady years of the Oslo Accords. As Nathan Brown observed, “Palestine is, in short, a model liberal democracy. Its most significant flaw is that it does not exist.” This discrepancy between envisaged democratic leadership and reality can be explained by the neopatrimonial nature of the Palestinian political system. Neopatrimonialism is a hybrid model in which state structures, laws, and regulations are formally in place but overridden by informal politics and networks of patronage, kinship, and tribalism. Instead of being organized according to merit, public function, or administrative grades, a neopatrimonial regime finds its glue in bonds of loyalty to those at the top of the political hierarchy. In an institutional context in which Palestinians have no mechanisms to hold their leaders accountable, Palestinian neopatrimonialism has created a situation impervious to serious change in leadership or political system. Though the PA, after the onset of the Second Intifada, began to make attempts at reform, Palestinian political structures have remained corrupt and captured by one political faction, Fateh. The assets and resources of the Palestine Liberation Organization (PLO) and the PA have been channeled toward serving the interests of the few at the expense of the majority. The constant failure to reach a reconciliation agreement between Hamas and Fateh, despite announcing a national unity government in early 2017, also speaks volumes in regard to Fateh’s power monopoly and its marginalization of other Palestinian political actors and their constituencies. Power sharing is a prerequisite to the establishment of a solid national unity government, and requires fundamental changes to the current political setup. As a result of Fateh’s control of the PA and the PLO, the Palestinian administrative and political machines run on dynamics of inclusion vs. exclusion and reward vs. punishment – fundamentally, according to loyalty. Appointments of public positions and promotions, for example, are awarded or withdrawn not on the basis of performance or professional merit but on the level of loyalty to the leadership. Relatedly, in 2017 President Abbas forced 6,145 PA employees in Gaza into early retirement to pressure Hamas to cede control of the Strip. The number of PA employees in Gaza – both civil and security – is estimated to be around 50,000. Despite Hamas seizing control in Gaza, their salaries continue to be paid – albeit at a lower rate –to secure their loyalty to the PA. At the same time, Abbas uses government resources for political exclusion and punishment. A particularly abominable instance of this was the cutting of PA payments to Israel for electricity in Gaza, reducing the electricity supply to the Strip’s two million inhabitants to four hours a day. The PA’s reliance on foreign aid has also undermined the Palestinian political system by making it accountable to international donors rather than the Palestinian people. The PA’s reform agenda and anti-corruption efforts have mostly stemmed from US and EU pressure since the outbreak of the Second Intifada, when the security situation on the ground deteriorated. The intent behind the agenda has been clear: Emphasize security over administrative reform and thus ensure the security of Israel at the expense of the security and basic civil and political freedoms of Palestinians. This has been reflected in the prioritization of security in the PA’s budget allocations, with that sector taking 28% of the annual budget at the expense of other, more vital sectors such as health, education, and agriculture. The PA’s new agenda does not acknowledge that Fayyad’s state-building phase failed to lead to statehood, let alone democracy. The international donor community hailed Fayyad as the Palestinian good governance messiah as his cabinet led efforts to create a de facto Palestinian state under the Israeli occupation in the context of a major political schism between the two largest Palestinian political factions. Fayyad’s reforms did not go beyond technical and administrative parameters to ensure that whatever shakeup the cabinet made did not rock the entire boat. The 2003 restructuring of the prime minister position itself under US and EU pressure to loosen Yasser Arafat’s executive grip is another example of how futile these structural reforms are in such a context. The prime minister’s role, decisions, and policies must be in line with Fateh and the president, as the prime minister simply implements the president’s decisions and has no political standing of his own. When Fayyad filled the position in 2007 and embarked on his reform plan, he became the target of senior Fateh officials who continuously pinned the PA’s ailments and the effects of the economic crisis on Fayyad’s policies. 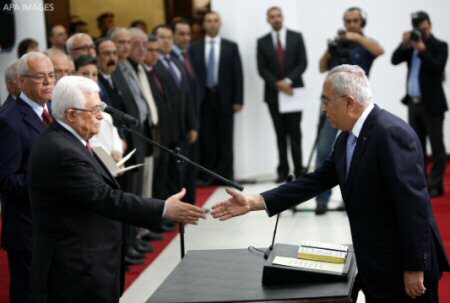 The international community’s strong financial and political backing of Fayyad also constituted a threat to Abbas, who did not defend his premier against the attacks of his party and challenged his authority by overruling some of his decisions. To end corruption and ensure accountability in the Palestinian context, an institutional and political overhaul, rather than limited and fragmented political and legal reforms, is necessary. The repeated patterns of Fateh’s power monopoly, systemic corruption, and informal politics, in addition to the current political stagnation, suggests that it is past time for Palestinians to build new institutions that are more democratic and more representative of their rights and needs.